Samir Nasri has been banned from football for six months after breaching UEFA and WADA anti-doping regulations. 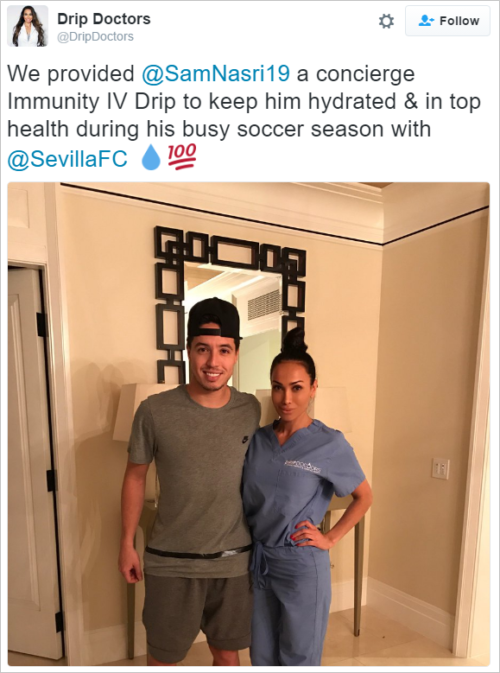 Nasri, who is without a club since leaving Antalyaspor last month, has been suspended over his fabled trip to Los Angeles to visit the “Drip Doctors” in 2016 – an ill-advised excursion that led to the Frenchman enduring a lively old night on social media. The midfielder was on loan at Sevilla from Man City at the time the following photo ended up on Twitter. A couple of months after the trip, UEFA ruled that the 500ml of intravenous hydration he received from the Drip Doctors in his LA hotel room (so that’s what we’re calling it now, huh?) exceeds the 50ml infusion limit for active athletes set by WADA. This after Nasri and his lawyers attempted to apply for a “retroactive therapeutic use exemption” – otherwise known as a TUE, the little crutch all those asthmatic Tour de France winners rely so heavily on. The Court of Arbitration for Sport have today upheld UEFA’s original decision, meaning that the 30-year-old will be unable to take part in “football action” until next season at the earliest. We’d suggest that he is now all but finished as far as top-level football is concerned, but the terminal rot set in with Nasri long before this fiasco ever came to a head. Samir Nasri: the most punchable footballer of all time? No, that would be your mother. Joey Barton? Robbie Savage? El Hadji Diouf? I beg to differ…Dennis Wise and Jack Wilshere must be way ahead of him in that respect.